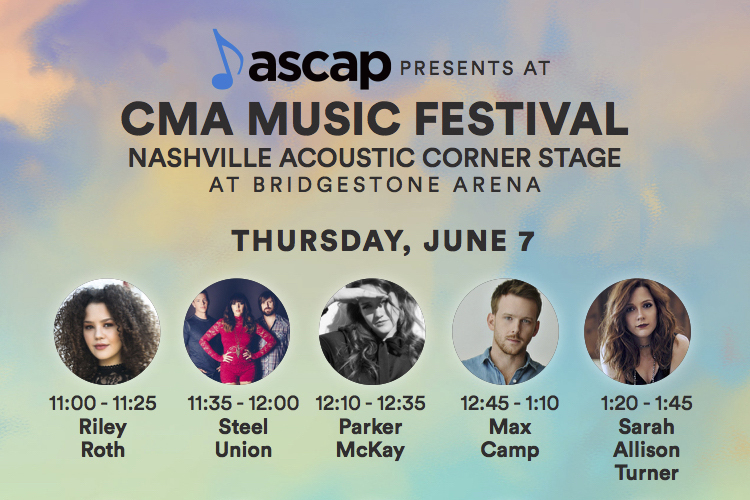 ASCAP will present its annual CMA Music Festival showcase of emerging songwriter-artists at the Nashville Acoustic Corner Stage at Bridgestone Arena on Thursday, June 7 from 11 a.m.-5 p.m. Featured performers include Dylan Brady, Max Camp, Hannah Dasher, Austin Jenckes, Parker McKay, Riley Roth, Steel Union, Matt Stell, TRAVLRS and Sarah Allison Turner. For the fifth consecutive year, ASCAP will present a hit songwriters round at the HGTV Lodge on Friday, June 8 at 4 p.m. The showcase will feature Sony/ATV songwriter Chris DeStefano, RCA Nashville songwriter-artist Ryan Hurd, and Big Loud Records songwriter-artist Jillian Jacqueline. The Lodge is a fan favorite located on 4th Ave just south of Broadway. ASCAP’s CMA Music Fest stages over the years have featured stars like Kelsea Ballerini, Old Dominion, Brothers Osborne, Carly Pearce, Jacob Davis, Eric Paslay, Clare Dunn, Striking Matches, Alyssa Bonagura (of The Sisterhood) and more.